The enormity and vastness of the cliff forming the north face of Notch Peak is difficult to describe. Standing near the cliff’s base and looking up is awe inspiring. The view while standing at the top and looking over the edge? I would not know as I was on my hands and knees, too fearful to stand and look over the edge at one of the greatest vertical drops in the contiguous U.S.
Reported estimates of the cliff’s actual height vary significantly from under 2,000 feet to over 4,500 feet, which is likely due to differences in defining where the base of the cliff starts. Photogrammetry (measurements from digital stereoscopic photographs), verified with a paper 7.5′ topographic map, suggests the cliff has an uninterrupted near-vertical drop of over 1,500 feet. The addition of cliff below a small bench 50 to 100 yards wide increases the distance to approximately 2,250 feet. Adding a portion of the very steep base of the sheer drop increases the distance to nearly 2,900 feet. El Capitan (~2,900 feet of near vertical drop) and Half Dome (~2,000 feet of near vertical drop). Kings Canyon National Park, California. Example: Tehipite Dome (~3,400 feet of near vertical drop). Balloon Dome (outside of Kings Canyon and Yosemite but also in the Sierra Nevada), California. Example: the west face (~3,000 to 4,000 feet of cliff and/or very steep slope). Cascade Range, Washington. 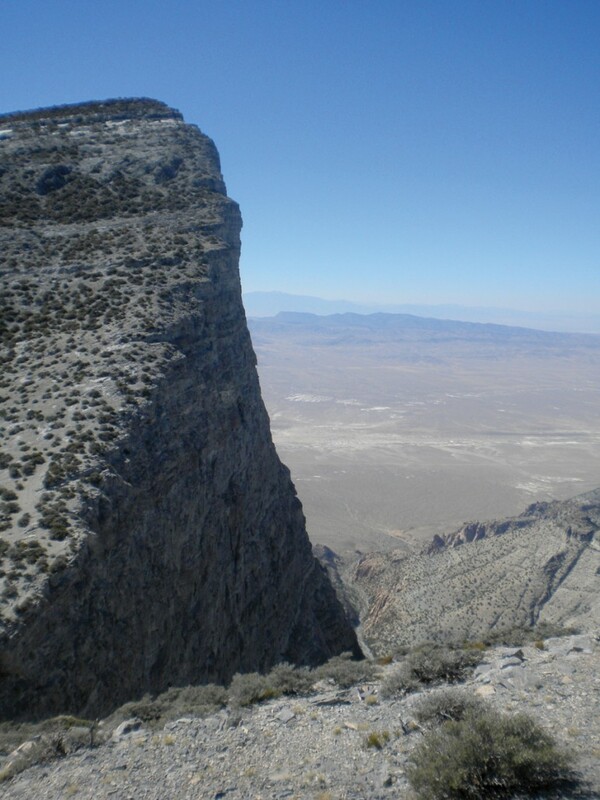 Example: the northeast face of Johannesburg Mountain (~4,000 feet of cliff and/or very steep slope). Glacier National Park (carbonate cliffs similar to Notch Peak), Montana. Examples: the east face of Mt. Gould and the north face of Mount Siyeh (~3,800 and ~3,500 feet respectively of cliff and/or very steep slope). Grand Teton National Park, Wyoming. Example: the south face of Mt. Moran (~4,500 feet of interrupted near vertical drop). Black Canyon of the Gunnison National Park, Colorado. The Painted Wall (~2,000 feet of near vertical drop). Zion National Park, Utah. Sandstone cliffs (~2,000 feet of near vertical drop). 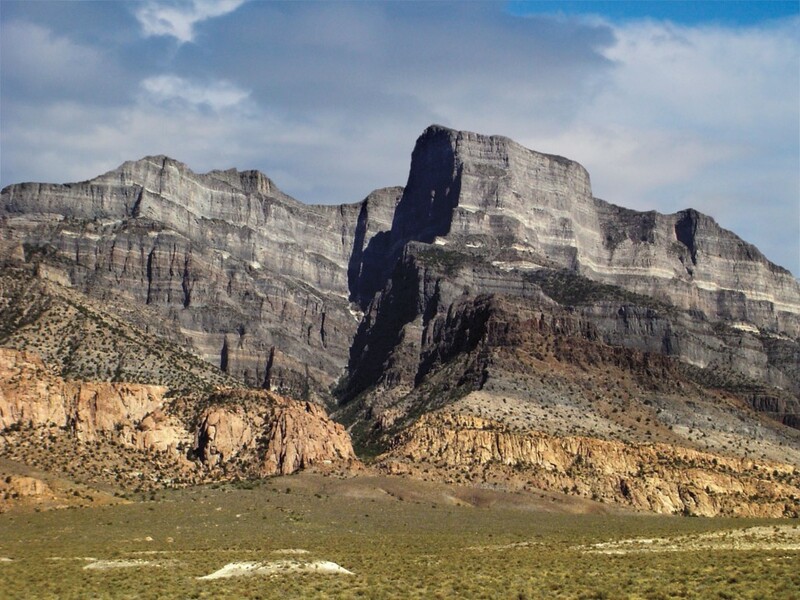 Though Notch Peak is a natural wonder rivaling those commonly seen in state and national parks, its remote location in a state filled with competing natural wonders results in it not being well known, nor often visited. Notch Peak is composed of 500-million-year old limestones and dolomites of the Notch Peak, Orr, and Weeks Formations. A 17-million-year old granite intrusion (sill) crops out at the base of this limestone sequence. 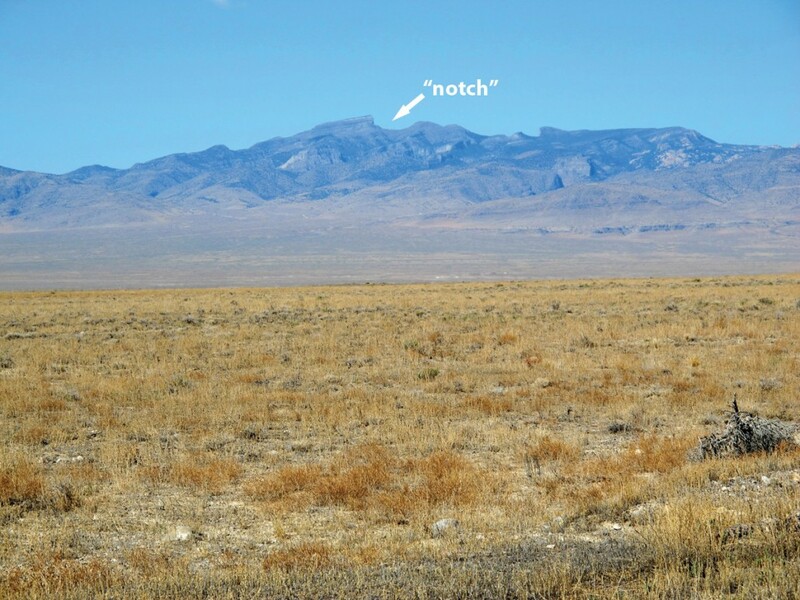 Following the pattern found across the Basin and Range Province from western Utah to eastern California, a north-south oriented high-angle fault uplifted the mountain front on the west side of Notch Peak. This uplift allowed erosion to carve the peak’s great cliff. 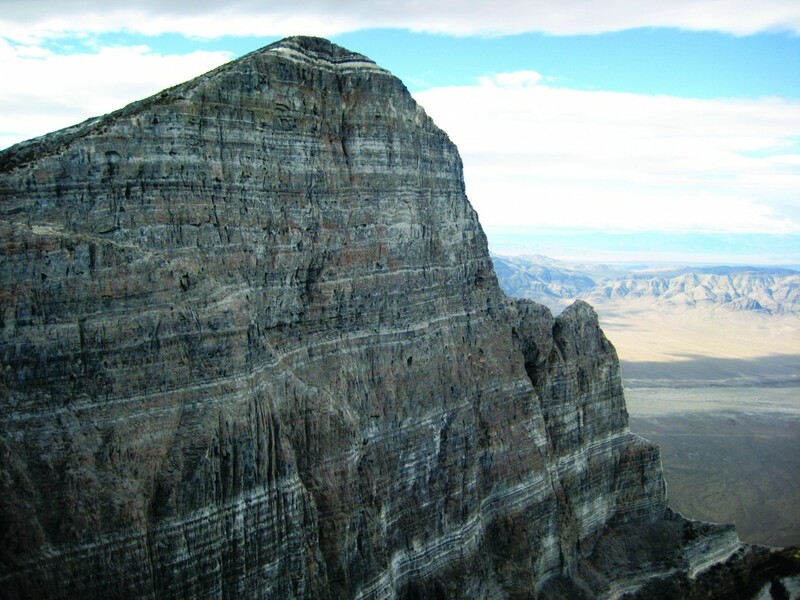 At least two factors contributed to make Notch Peak’s north-face cliff grander than any other in the Basin and Range Province. First, the cliff is composed of a nearly uninterrupted sequence of strong, weather-resistant, massive limestone and dolomite beds that generally lack shale or other weak layers. 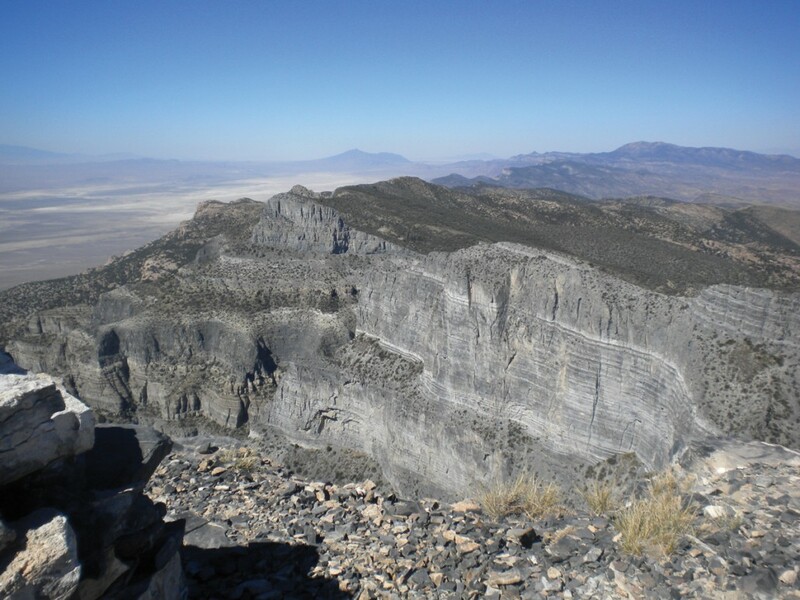 Where significant shale beds do exist, they create a small bench near the top of the Orr Formation approximately 1,500 feet below the peak’s summit. Secondly, the massive limestone and dolomite bedding is nearly flat and horizontal (not folded). 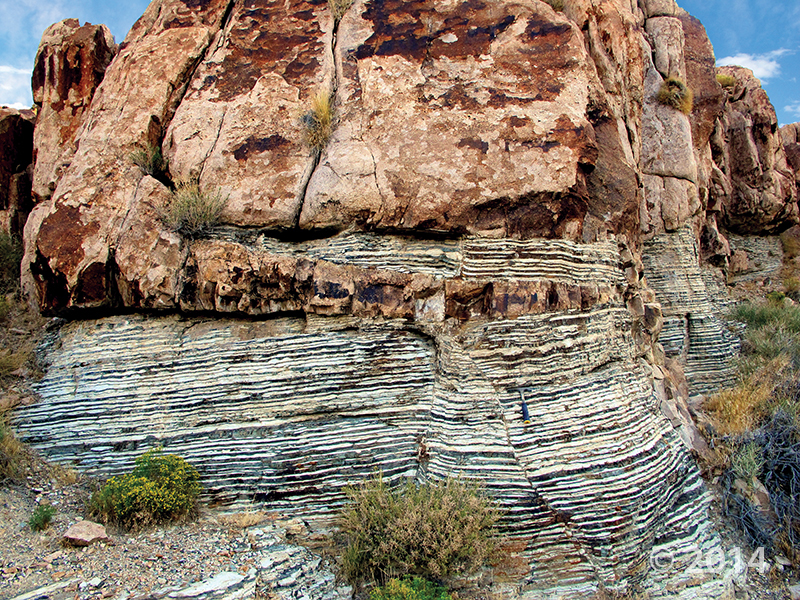 Tectonic folding could have resulted in fractures that weaken rock layers. 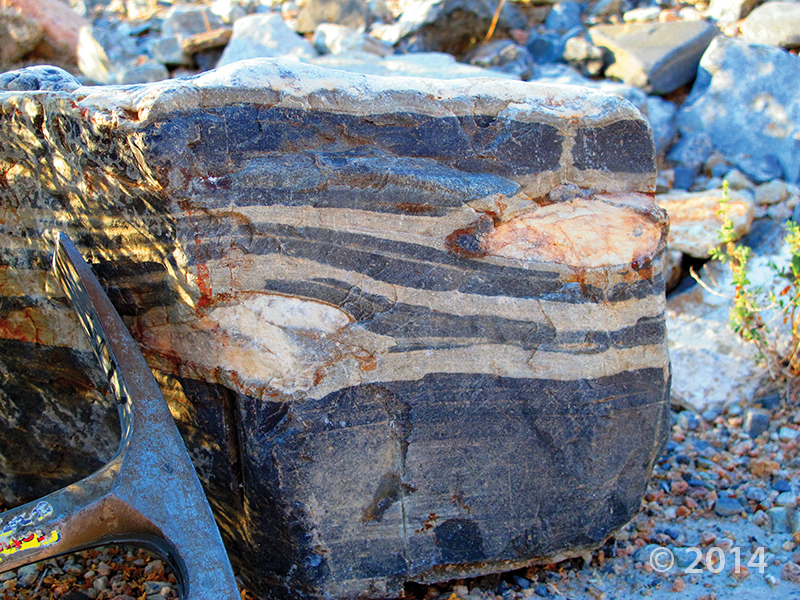 Similarly, tectonic compressional forces have not thrusted these rock layers over one another. Elsewhere in the Basin and Range past episodes of tectonic folding and thrusting have fractured and weakened otherwise similar formations and thereby reduced their integrity and ability to form towering cliffs. Though there is no clear evidence for such, an east-west oriented fracture (perpendicular to the range-front fault) could have provided a zone of weakness contributing to the north-facing orientation of the peak’s greatest cliff. Notch Peak is part of Sawtooth Mountain, which comprises the southern part of the House Range. It is immediately north of U.S. Route 6/50, between Delta, Utah, and Baker, Nevada. Be advised, there are no gas stations, nor any other services in the vicinity of Notch Peak. It is in the proverbial middle of nowhere. 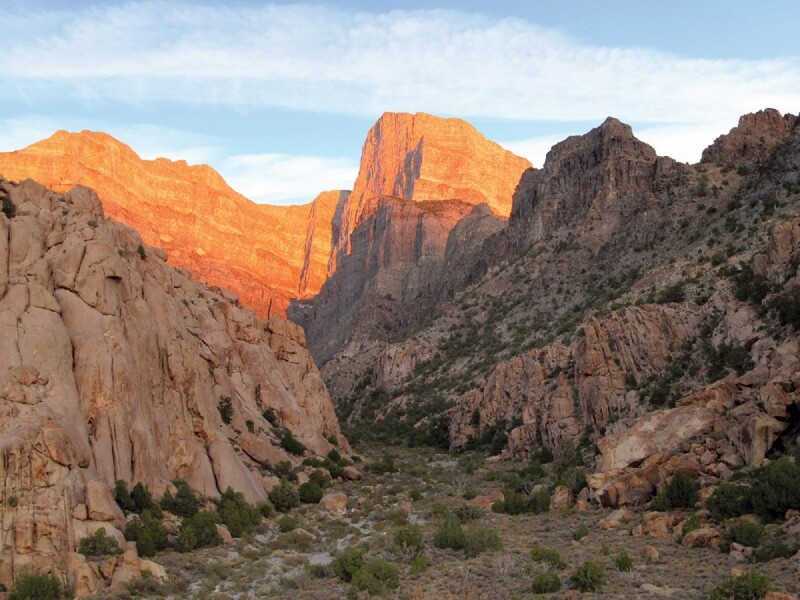 Between U.S. Route 6/50 and Painter Spring, Tule Valley Road provides stunning views of Notch Peak and its cliffs. Located 9½ miles north of U.S. Route 6/50, a less traveled dirt road leaves Tule Valley Road and leads towards the base of the cliff. Use discretion when driving this second dirt road as it does not appear to be maintained and may be impassible.